Sargent Art 24-Count Fine Tip Marker set is ideal for drawing or writing in vibrant permanent colors. 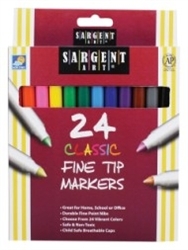 All 24 classic, vibrant color markers have fine conical tips and ventilated caps. Set is packaged in peggable box and are AP Certified non-toxic.